form, whether it's an iPad, an iPhone, any written form through the Web, through Twitter," Kravetz proclaimed at the announcement of his new position. 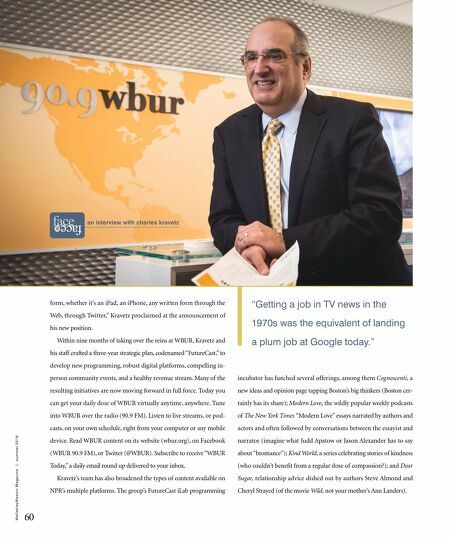 Within nine months of taking over the reins at WBUR, Kravetz and his staff crafted a three-year strategic plan, codenamed "FutureCast," to develop new programming, robust digital platforms, compelling in- person community events, and a healthy revenue stream. Many of the resulting initiatives are now moving forward in full force. Today you can get your daily dose of WBUR virtually anytime, anywhere. Tune into WBUR over the radio (90.9 FM). Listen to live streams, or pod- casts, on your own schedule, right from your computer or any mobile device. Read WBUR content on its website (wbur.org), on Facebook (WBUR 90.9 FM), or Twitter (@WBUR). Subscribe to receive "WBUR Today," a daily email round up delivered to your inbox. Kravetz's team has also broadened the types of content available on NPR's multiple platforms. 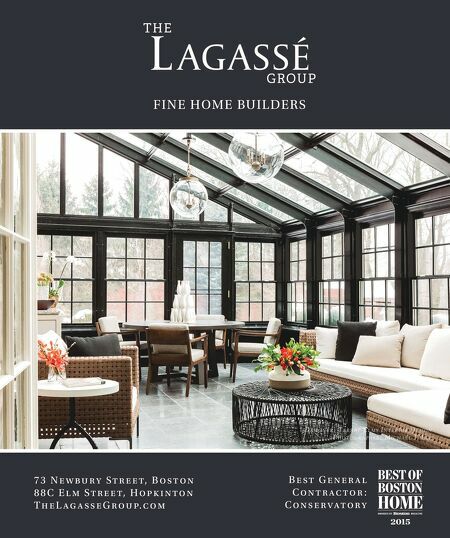 The group's FutureCast iLab programming 60 W e l l e s l e y W e s t o n M a g a z i n e | s u m m e r 2 0 1 6 incubator has hatched several offerings, among them Cognoscenti, a new ideas and opinion page tapping Boston's big thinkers (Boston cer- tainly has its share); Modern Love, the wildly popular weekly podcasts of The New York Times "Modern Love" essays narrated by authors and actors and often followed by conversations between the essayist and narrator (imagine what Judd Apatow or Jason Alexander has to say about "bromance"); Kind World, a series celebrating stories of kindness (who couldn't benefit from a regular dose of compassion? ); and Dear Sugar, relationship advice dished out by authors Steve Almond and Cheryl Strayed (of the movie Wild, not your mother's Ann Landers). an interview with charles kravetz "Getting a job in TV news in the 1970s was the equivalent of landing a plum job at Google today."